La Pelanga is, technically, a music blog, but the World Cup starts tomorrow, and seeing as all the pelangueros are fútbol fans, I thought I’d post this. Last week, I wrote a piece for The New Republic about my father’s brief career as a radio broadcaster, calling soccer matches back in Arequipa, Peru when he was still in his teens. I also recorded this interview, and asked him to try his hand at it again. So, toward the end of this podcast, you can hear my father, Renato, calling a game between Peru and Brazil, a match that actually took place in the 1950s, memorable because we actually won. (By we, I mean Peru, of course.) My father hadn’t called a game like this in some fifty years, so I’d say he sounds pretty great. Mil gracias, Pa! Saludos to all the fútbol fans out there. I’ll be writing about the tournament on the The New Republic’s Goal Post blog. You can read my first post, about how hard I’m finding it to root for Maradonna here. 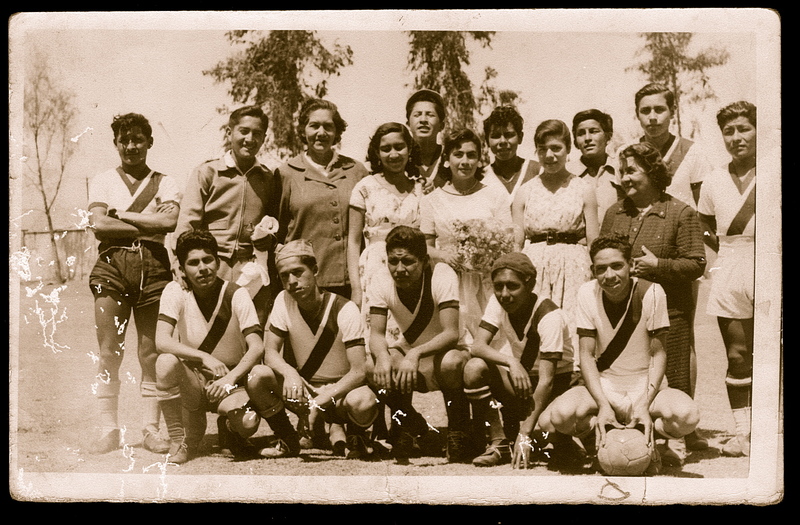 The photo shows a team my father coached, Corazón Independiente, circa 1955. He’s standing, second from the left, with his arm around my grandmother. Next to her is my aunt Vilma. This entry was posted in PELANGA RECORDS! and tagged Arequipa, Corazón Independiente, Futbol, Renato Alarcón, World Cup by Franz Tunda. Bookmark the permalink. This cultural practice of listening to soccer games was widely extended in South America, I remember how my uncle used to carry a small transistor radio to listen to the world coup and the local tournaments. The narrators were very creative and if the game became boring some would made-up great moves and rivalries that always ended in our national team almost scoring a goal.